I needto display some additional text in hikashop_product_right_part of the product view. And I need to do this for particular categories and their subcategories only..
How do I achieve this in Hikashop Essential? You can create a custom field of the table "product" via the menu Display>Custom fields. 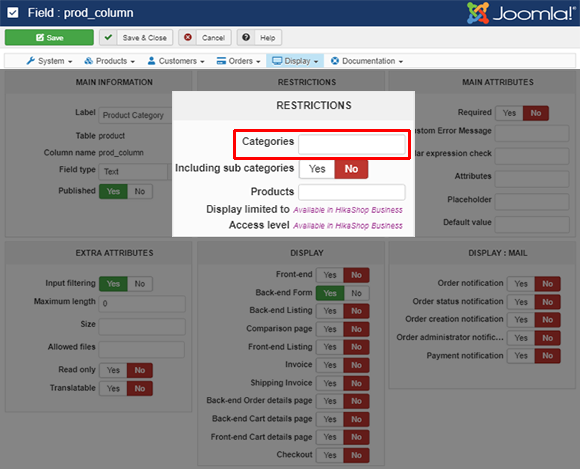 If you enter some text in the custom field in the product, it will be displayed on the product page of that product on the frontend if you activate the corresponding display option of the custom field. Products without the custom field filled in won't have it. Thank you for your answer Nicolas. The problem with the custom field is that it all depends on the user editing the custom field. I'm looking for a way to force the displayed text if the product belongs to particular categories. Is there a way to do this in php and can you help me with the code? Hope this will fit your needs. I thought of that, but the customer is using Hikashop Essential. The category restriction is only available in the Business version. It's a very small shop and they don't want to upgrade to the Business version just because of this. Meanwhile we have placed the text in the Joomla sidebar. In that case, in the show_default view file, you have the categories of the current product in $this->categories. So you could add some custom code on that array to check if the product is is one category or not and then echo the text you want.